It just isn’t fair! Yesterday, a sweltering 91 degrees here in Red Wing. Yet a freeze warning has been issued for tomorrow night, with a predicted low of 29 degrees! The strong north winds tomorrow will probably carry with them many of the hummers hanging out in my yard lately, and the freeze predicted for tomorrow night may prematurely lay waste to the flowers in my garden. Today, however, a one-day respite between the heat and the frost, I enjoyed a gorgeous 68 degree afternoon in the garden. 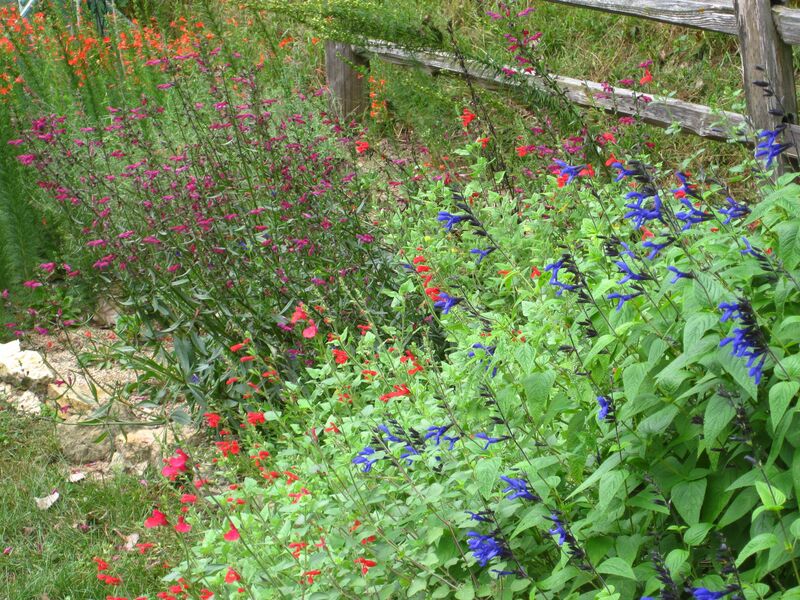 Hummingbirds have carved up the garden into many small feeding territories, and there were numerous battles over the blooming salvias and cardinal climber. I made a conscious effort to enjoy the company of the hummers and the beauty of the flowers, because they may be mostly gone in a couple of days. Update: Fortunately for me, although the official low in Red Wing was below freezing, my yard managed to escape a killing frost. A few of the most frost-tender plants got nipped a bit, but otherwise no damage–whew!